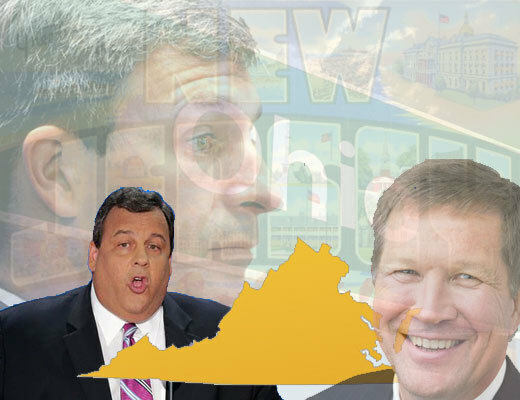 Will Ohio 2014 Look More Like New Jersey or Virginia? 1. Libertarian Robert Sarvis was, in effect, a Democratic prop that cost a real conservative a winnable election. Even Ron Paul said Virginians would be insane to vote for him. His 6% of the vote spoiled the election from Cuccinelli. 2. Chris Christie’s landslide and demographic breakthroughs were impressive. He isn’t conservative, so I’m suspicious, but there is something endearing about his punchy style. Most intriguing, however, is this question: What might the VA and NJ elections predict about Ohio’s own gubernatorial election next year? Let’s start with what we know based on Virginia and New Jersey’s results and Ohio’s current political climate before moving onto the unknowns that will unfold over the next 12 months. Ken Cuccinelli has more comprehensive conservative credentials than Chris Christie or John Kasich. Sure, he hasn’t had to govern a state or face down the forbidden fruit of Medicaid expansion. But, on the whole, let this be the judge: Ken Cuccinelli got painted by the leftist media as too close to the TEA Party. That’s not happening for Kasich or Christie. Moreover, while in D.C. during the Values Voter Conference, I never heard one conservative complain that Ken Cuccinelli wasn’t conservative enough. On the contrary, they campaigned for him and thought he was the real deal, an image reinforced by his lawsuit against Obamacare. As mentioned above, Ken Cuccinelli lost on paper because of a combination of the following: 3rd party candidate Robert Sarvis took 6% of the vote (see observation #1 above), Northern Virginia is overrun with Democratic government employees who, because of the shutdown, hate anyone with an R after their name, and Cuccinelli ran out of days to get the full boost from the Obamacare rollout debacle (even if it did help him make up ground quickly and close a double digit gap in 2 weeks). In the Garden State, Chris Christie demolished his opponent and clinched reelection in such a way that political talk for the rest of the week was whether the GOP should hitch their 2016 hopes to his prodigious caboose (apologies to Gov. Christie–he’s looking much healthier after his surgery). Chris Christie made great inroads into demographics that destroyed Mitt Romney, Ken Cuccinelli, and pretty much anyone else who has run in the GOP–women, young people, black, latino, et al.–and dominated independents. People love Christie’s personality: charisma meets punchy-straight-talk. Nevertheless, conservatives aren’t buying his credentials (he supported gun control and medicaid expansion) despite that he has supported life, opposed taxes, and fought unions. What might all of this mean for Ohio, one year out from our own gubernatorial election? Ohio’s base is much larger and a deeper red/purple than blue New Jersey. Ohio’s electorate more resembles Virginia’s than New Jersey’s in size and battleground nature. That could help Governor Kasich soundly defeat Ed FitzGerald, ala Christie obliterating Buono. But, counter-intuitively, Ohio’s deeper shade of red could hurt Kasich more than if he were in a bluer state. Ohio’s Republican base is much larger and more aggressively conservative than Christie’s. This is precisely why Christie may struggle in the Republican 2016 presidential primary in very conservative states. The base in more conservative states doesn’t have much of an affinity for moderates. They love to apply the Biblical warning to the Laodiceans to Republicans (“I will spew the lukewarm out of my mouth”). They don’t have a stomach for RINO. In that regard, Libertarians and the TEA party have declared open season on Governor Kasich’s re-election bid. They have dug their feet in, said, this is where we make our stand, and even started a RepublicansForEarl website devoted to their 3rd party candidate. There’s a chance that the TEA Party could turn Libertarian Charlie Earl into the most famous third party candidate since Ross Perot, making Robert Sarvis’s 6% siphon look like a blip on the radar. Think about it: given Medicaid expansion, I doubt Ron Paul is running to Ohio to plead with his supporters that John Kasich is a “defender of liberty,” as he did for Cuccinelli. Still, Kasich’s poll numbers place him well in front of his opponent, Ed FitzGerald, the liberal Democratic Cuyahoga County Executive, whose campaign hasn’t exactly been off to a hot start. Will the TEA Party be able to ensure that many conservatives don’t opt for a “lesser of two evils” rationale? How do they ensure that many conservatives won’t say, “I hated Kasich’s Medicaid expansion move with the controlling board [read on OCR: “Separation of Loopholes”], but until he directly betrays me on life or marriage, I’m liking him better than a liberal Democrat who diametrically opposes my values”? But let’s say the TEA Party does get that type of widespread conservative buy-in and the rebellion is full-speed ahead. It’s not beyond the realm of possibilities, given how much Kasich has exacerbated conservative wounds from Portman’s reversal on marriage, the ORP, etc. [Read on OCR: “Kasich, Portman Should Brace for Consequences.”] Just ask Mike DeWine in 2006. An Ohio Republican can’t afford for conservatives to stay home unless he can sweep independents and pick up the few conservative Dems that still exist. This is John Kasich’s big electoral gamble: Can he pull in a Christie-like coalition to offset his conservative/libertarian losses? Can he pull off the populist appeal that sells effective, albeit not limited, government? This appeal centers on the claim that big government is only bad when run by Democrats. A Kasich loss because of conservative sitout will be a self-described victory for the TEA party and conservatives who believe that party suicide is worth showing the Republican Party that they cannot use and abuse conservatives, that they will pay a great cost, and that they need conservatives more than conservatives need the GOP/ORP. On the other hand, a Kasich win will probably mark a death knell for the TEA Party’s influence. If Republicans can win without the right wing, the Establishment will rejoice and the TEA party will lose credibility. So it all comes down to this. Will Kasich, facing a weak opponent, channel Christie’s appeal and ride to a big populist victory? Or will he be done in by a conservative exodus to a third party spoiler? Hold on tight folks. It’s going to be an interesting 12 months.